Robin Good: A great overview of the "tablet" universe and what it has offered us in the last 12 month accompanied by a gorgeous infographic poster. From the article intro: "Consumers were flooded with a torrent of new tablet options in 2011. With over 40 tablets available on a handful of platforms only a few can stand out. We’ll attempt to break down what we saw, highlight what’s working and point the way forward." If you need to create rapidly and easily a mini-app or website that is touch-based and which to include your selected set of video, images and texts TouchAppCreator can come in handy. TouchAppCreator enables everyone to create touch-optimized, and content-centric mobile web apps for both iPhone and iPad in a few minutes on the go. You can edit your app ONCE and generated app supports both iPhone and iPad automatically. No sign up is required. Google has updated its mobile magazine publishing platform Google Currents with a new version already available on Android devices (and coming very soon to iOS. This new release showcases a fresh layout for images and text and new ways to scan through content and breaking stories that easily adapts to any type of mobile device screen. From the Google Android official site: "We’re now grouping editions into categories to help you keep track of your existing subscriptions and discover new ones. Check out editions related to your interests through categories like Entertainment, Sports, Lifestyle and more. category and dive into editions with articles of interest." Google Currents keeps up the good fight with some valuable mobile improvements. Aplikacja Currents od Googla przeszłą kolejną falę modernizacji, pozwala nam teraz sortować wiadomości po najświeższych, popularnych itp. Nadal jednak jest daleko za Flipboardem który pozostaje numerem 1 od kilku lat. Robin Good: If you are interested i understanding how most people utilize and move between the use of their smartphone or tablet, to their desktops or TV screens and viceversa, this elegantly illustrated feature by Google, will definitely provide you with some new insight and some relevant data. "Today 90% of our media consumption occurs in front of a screen. As consumers balance their time between smartphones, tablets, PCs and Televisions, they are learning to use these devices together to achieve their goals." -> 90% of consumers begin a task on one device and then complete it on another device. -> Smartphones are by far the most common starting point for this sequential activity. -> TV no longer commands our full attention. -> TV strategy should be closely aligned and integrated with the marketing strategies for digital devices. In essence: "While consumers are using more than one device simultaneously, content viewed on one device can trigger specific behavior on the other. Businesses should therefore not limit their conversion goals and calls to action to only the device where they were initially displayed." Joan Stewart: Nice scoop from Robin Good, Google is adding new app designs on an ongoing basis, easy diagram to follow what is happening with TV and Mobile mainly, they appear to be the focus. Robin Good: The RWD Bookmarklet is a very useful and effective tool that allows you to test the display of any web page (even if it is only on your computer) on most smartphone and tablet display screens. How it works: Go to this page http://responsive.victorcoulon.fr/ drag the bookmarklet onto your browser bookmarks bar and then open a new tab where you load up the web page you want to test. Then click on the bookmarklet and you are ready to go. Robin Good: MIT App Inventor is a visual web app that allows you to code and test Android apps without needing to write a line of code. "MIT App Inventor, originally conceived and built out of Google Labs, democratizes app creation for Android smartphones. In this video, you'll see just how easy it is to create a simple app with MIT App Inventor." From the official site: "Creating an App Inventor app begins in your browser, where you design how the app will look. Then, like fitting together puzzle pieces, you set your app's behavior. All the while, through a live connection between your computer and your phone, your app appears on your phone. You can build many different types of apps with App Inventor. You can build apps that inform and educate. You can create a quiz app to help you and your classmates study for a test. With Android's text-to-speech capabilities, you can even have the phone ask the questions aloud. To use App Inventor, you do not need to be a professional developer. This is because instead of writing code, you visually design the way the app looks and use blocks to specify the app's behavior." N.B. : Requires a Google account to be used. Robin Good: While many are rushing to build their first native app, many publishers are starting to choose web-native HTML5-based solutions which work across all devices. From the article intro: "A couple weeks ago, MIT Technology Review's editor in chief and publisher Jason Pontin wrote a piece about killing their app and optimizing their website for all devices with HTML5. That same week, Lonely Planet's Jani Patokallio predicted that HTML5 would nudge out the various ebook formats." Robin Good: Finally Google Currents is available internationally allowing thousands of independent publishers outside of the US to tap into the simplicity and power of this mobile publishing system. From the official Google Mobile blog: "After the U.S. launch, the top features readers requested were to make the app available internationally and to allow content to sync quickly. We’ve heard you, and today we’re making Google Currents 1.1 available around the world. Hundreds of U.S. editions are now readable in your preferred language with a new publisher-selected translation feature, and local publishers can begin adding their content to the catalog through Google Currents Producer. With this update, we’ve made Google Currents available globally, wherever apps are available on Google Play and the Apple App Store. International publishers, using Google Currents Producer, can now begin adding local content for an international audience, choosing where to make it available globally and whether to enable auto-translation. To help you enjoy content in your preferred language, we’ve integrated Google Translate into Google Currents. Just press the globe icon while reading an edition, and you can automatically translate that edition to one of 38 supported languages." Easy to use, free web "experimental" app, makes it easy to test how a web site would look on an iPad screen. A built-in Safari app lets you test how browsing any web site would work. Similar tools: iPhone4Simulator and TestiPhone.com. 7" Tablets Compared: Which Is The Best? Robin Good: Andrys Basten does an excellent job of curating and bringing together the best and most interesting info relating to the top 7" tablets available on the market. From the Kindle to the Nexus and the iPad mini, you can find out what are the key differences, the pros and cons of each one. Robin Good: Soundgecko is a new web service which allows you to convert any RSS feed or web article into a MP3 audio file that can be downloaded and listened to on your iPhone (Android and Windows Phone versions coming soon). From the official site: "SoundGecko is a text-to-audio transcribing service that lets you enjoy written content from around the web"
"With a SoundGecko subscription, stay up-to-date with the latest articles from you favorite blogs and websites RSS feeds by listening to them. Also send your PDF documents and more." "Connect your Google Drive or Dropbox account and get MP3 audio files sent straight to your cloud drive so you can listen at home." The free service account allows for 30 articles per month and one RSS feed, with no PDF support. 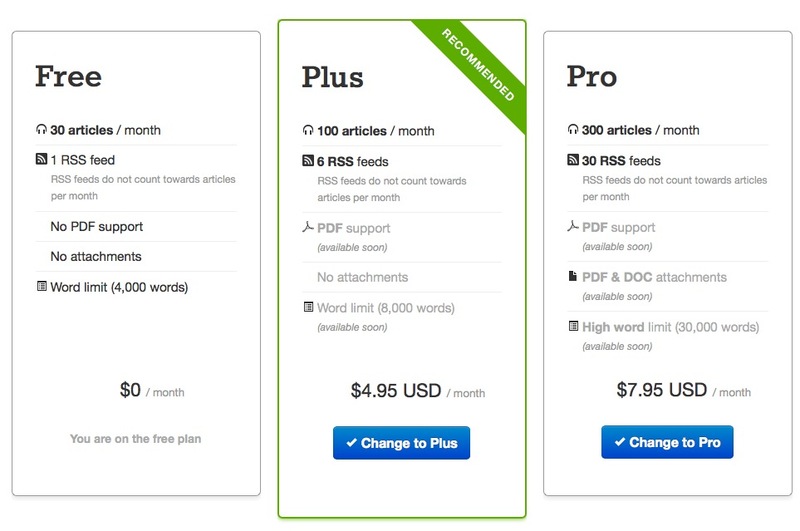 The Plus plan at $4.95 offers a max of 100 articles read per month, 6 RSS feeds and PDF support. A Pro account costs $7.95/month and it offers conversion of 300 articles, 30 RSS feeds and full support for PDF and DOC documents. Robin Good: Webr is a new iOS app for your iPhone, which allows you to rapidly create web sites, with your preferred text, images and blog pages, without having any technical knowledge. Finished websites may not look that great on your desktop computer, but they do look super ok on any iPhone device. From the appadvice.com review: "...Once you’ve added the content you would like, it’s time to select what the overall site will look like. The theme button takes you to the gallery of the 10 different setups you can select. In the advanced settings you can select which of the pages you’d like to be your homepage, add images with captions, add meta data, as well as provide a direct link to your Facebook and Twitter accounts. Any changes you make will not be released until you edit the site’s settings within the app. A green “done” button will upload all of the changes instantly, and you’re good to go. You can even change the site’s name and the URL will change as well. Any site you make will have the “.webr.ly” domain name as a suffix... The webr icon will also be nested in the bottom left corner." Robin Good: Appafolio is a web app which allows you to create image and video portfolio apps for iPhones, iPads and Android devices (soon). The web-based app guides you through the creation of the individual app sections by allowing you to add images, slideshows, clips and video compilations as well as text-based content. You can choose and personalize the look and feel, splash page, icons, and navigation of the final app. The free account option allows anyone to create, edit and test a full portfolio app that will work on your device, and which you can use to showcase your work in person. If you want to have more than one portoflio and more than 5 screens, you will need to spend either 29.99/year (no public app) or $99/mo (iOS app included) to distribute your portfolio in the App Store. Robin Good: The responsinator is a free web-based service which allows you to easily test any web site or web page URL designed to test responsive websites on 10 different device resolutions ranging from the iPhone and iPad and extending to Android and Kindle devices. All of the previews are showcased on a single scrollable page. Robin Good: An excellent introductory guide full of information an useful resources for anyone wanting to publish a mobile app to Google Play and to the Apple App Stores.